Dependent Origination: The 3 Lives Model - NOT! The Buddha's teaching of Paticcasamuppada (usually translated as Dependent Origination or Dependent Co-arising) is not only a difficult topic but is also the key to the entire Dhamma. After all, the Buddha said in MN 28, "He who sees Dependent Origination, sees the Dhamma; he who sees the Dhamma, sees Dependent Origination." The "standard" interpretation of Dependent Origination is the so called 3 Lives Model. 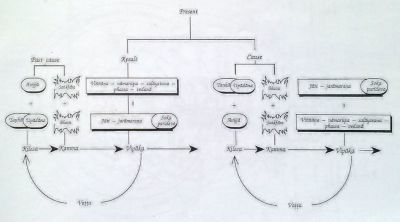 This is the model explained in the Visuddhimagga in chapter XVII. However, as Bhikkhu Bodhi says on page 313 of his introduction to the Wisdom section of In the Buddha's Words, "The Nikayas themselves do not give any systematic explanation of Dependent Origination in the way one might expect a college textbook to do." So it is up to us to do our best to understand exactly the Buddha was teaching here. This paper shows that the standard 3 Lives Model has serious logical flaws and is simply not tenable. It then goes on to examine other possible interpretations and their limitations. And in conclusion, it of course says you have to figure it out for yourself. But hopefully, along the way, it will provide food for thought, as well as point out common pitfalls. Remember, this is a limited view and explaniation of Dependent Origination! There is far more that can be said; I put this out there to counter the 3 Lives Model and provide a starting point for further thinking, pondering and discussion. And heeding the Buddha's advice to Ananda in DN 15, all works on Dependent Origination by those of us who are not arhants are both necessarily limited and works in progress! From Ignorance as a requisite condition comes Sankharas. From Sankharas as a requisite condition comes Consciousness. From Consciousness as a requisite condition comes Mind & Body. From Mind & Body as a requisite condition comes the Six Sense-Bases. From the Six Sense-Bases as a requisite condition comes Contact. From Contact as a requisite condition comes Vedana. From Vedana as a requisite condition comes Craving. From Craving as a requisite condition comes Clinging. From Clinging as a requisite condition comes Becoming. Decay and Death, sorrow, lamentation, pain, grief and despair. Sankhara: Concoctions; Fabrications; usually Formations. In Dependent Origination it is usually translated as Karmic Formations. But the Buddha never said that; he said "And what are concoctions? These three are concoctions: bodily concoctions, verbal concoctions, mental concoctions." Sankhara is also the fourth of the 5 Aggregates and is often translated there as "mental formations". The word "Formations" does capture the "made, created" aspect of Sankhara, but I prefer "Concoctions" or "Fabrications" because these two words point more to the "not exactly true" nature of the Sankhara. Vedana: Initial reaction to a sense impression - pleasant, unpleasant or neither-pleasant-nor-unpleasant; Affect. This is usually translated a Feelings - which gives a very wrong impression that Vedana has something to do with emotions - which it certainly does not. I prefer leaving Vedana untranslated with the hope that whoever is listening/reading knows it means "the initial reaction to a sense impression" and that it comes in exactly 3 flavors of pleasant, unpleasant and neutral. "Now from the remainderless fading & cessation of that very ignorance comes the cessation of concoctions. From the cessation of concoctions comes the cessation of consciousness. From the cessation of consciousness comes the cessation of mind & body. From the cessation of mind & body comes the cessation of the six sense bases. From the cessation of the six sense bases comes the cessation of contact. From the cessation of contact comes the cessation of vedana. From the cessation of vedana comes the cessation of craving. From the cessation of craving comes the cessation of clinging. From the cessation of clinging comes the cessation of becoming. From the cessation of birth, then aging & death, sorrow, lamentation, pain, distress, & despair all cease. Such is the cessation of this entire mass of Dukkha." This "cessation chain" is a very key teaching for seeing the limitations of various models of interpretation, as we will see below. This model says that the 12 factors of Dependent Origination are spread out over 3 lives: #1 and #2 are the previous life, #3 - #9 are the current life, and #10, #11 and #12 are the next life. Essentially, in your previous life, you acted in Ignorance and generated Sankharas which determined how your current Consciousness and Mind & Body are constituted. Your actions here, especially those associated with Craving and Clinging lead to your next life and determine how it starts out. But look what happens when you lay the "cessation chain" on top of the 3 Lives Model: With the ceasing of Ignorance in your previous life, there is the ceasing of Sankharas in your previous life. Therefore since the Sankharas ceased, your Consciousness and Mind & Body have ceased in this life. Oh wait, if you are reading this, then I guess your Consciousness and Mind & Body have not ceased in this life! So in order to get free of Dukkha in your next life, you need to go back to your previous life and generate the "remainderless fading & cessation of ignorance." This does present a serious problem - the way out of Dukkha is to banish Ignorance in a previous life so that in the next life after that previous life you won't have Consciousness and Mind & Body so thus you can avoid Craving and Clinging so you won't have a life after the life after you banished Ignorance! This make NO sense whatsoever. The Buddha taught the ending of Dukkha in this life - we don't have to wait for the next life. The Buddha said that one who was fully enlightened could not really be said to exist. The Buddha said that one who was fully enlightened had gone where the King of Death could not find them. All of the above certainly point to the fact that the standard 3 Lives Model is in serious need of being discarded and some new model(s) proposed. So let's try a 1 Life model. That would mean that all of the 12 factors happen in a single lifetime. But this presents the problem that being born happens after, not only Consciousness and Mind & Body come to be, but after Craving and Clinging. When we lay the "cessation chain" on top of the 1 Life Model, the only way out is to banish Ignorance before being born. And once again since you are reading this, I strongly suspect that you have been born and it's too late to get enlightened. So what if we modify the 3 Lives Model into a 2 Lives Model by including Ignorance and Sankharas in the current life and continue to have the next life be represented by Becoming, Birth and Decay & Death. This neatly avoids the problems of having to banish ignorance in a previous life or in the womb. There is a good bit of evidence in the Suttas to back up such a formulation. The analysis of Dependent Origination in SN 12.2 certainly fits such a model. DN 15 - Maha-nidana Sutta (The Great Discourse on Causality) gives a more detailed explanation of what the Buddha meant by many of these terms (there are only 9 links discussed in DN 15) and they too fit a 2 Lives Model. OK, so what if Dependent Origination doesn't operate over a lifetime, but operates moment to moment. This is the thesis in Buddhadasa's wonderful book Paticcasamuppada: Practical Dependent Origination. In this interpretation, Birth and Decay & Death refer not to physical birth and death, but to the birth and death of the ego/self/atta. As mentioned above, there is a good bit of evidence in the Suttas to indicate that the Buddha had physical Birth and Death in mind - see SN 12.2 and DN 15. Perhaps all the problems of the above interpretations can be solved by discarding the notion of these sequence as occurring strictly thru time. Obviously time is part of the sequences - for example: Contact -> Vedana -> Craving -> Clinging as well as Birth -> Death. But can you work towards understanding these sequences not necessarily as temporal but as plunging into the depths as well? Can you view this chain as an expanded telescope with Birth -> Death as the outermost section? If so, now collapse the telescope so the sequence Consciousness -> Mind & Body -> ... -> Craving -> Clinging fits inside with Becoming being both inside and outside (ok, so the telescope model breaks down there). Now telescope Ignorance -> Sankharas inside Consciousness. The Mind portion of Mind & Body include Vedana, Perception and Sankhara. 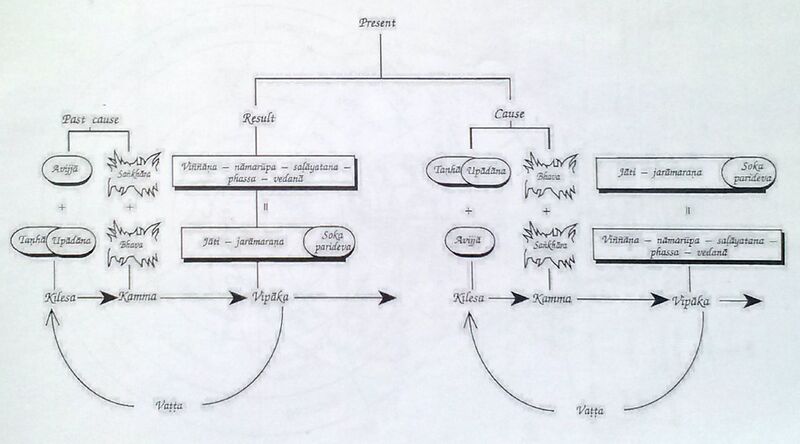 Both Craving and Clinging generate Vedana - see for example the detailed explanation of the 2nd Noble Truth towards the end of DN 22 - Maha-satipatthana Sutta - the list of enduring and alluring items includes Craving. The above are only a few of the example of the non-linear nature of the teaching on Dependent Origination. Dig deep - this is a rich vein, there is much to learn here if you can approach it with an open mind and lack of fixed concepts. Paticcasamuppada: Practical Dependent Origination by Buddhadasa Bhikkhu. All in the present life! I don't know about you, but I have yet to find any evidence ever of any dead people "making volitional formations," of even doing any volitional action at all!